Taqiyya from the root letters waw-qaf-ya has the meaning of caution or guard. Where technically the term is used for the dispensation from the requirements of one’s faith under compulsion or persecution and the real threat of torture or in life and death situations. In such extreme cases, God will not hold one accountable for the denial of faith or expression of blasphemy. 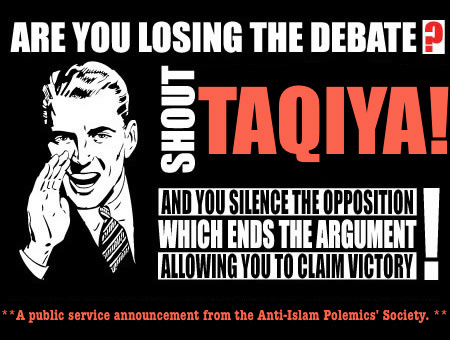 A few examples of circumstances where Taqiyya would be permitted are in the like of the times of the Biblical story of Abraham (peace be upon him), the Spanish Inquisition or the Crusades, the Bosnian genocide, the alleged tyranny of some of the Caliphs and Muslim Rulers throughout history till date and the menace of ISIS/ISIL. There is absolutely no warrant from the above Quranic verses to sanction deception for any perceived greater purpose other than preserving the sanctity of life. To assert otherwise is perhaps projecting one’s perceptions and sentiments onto others. A time between 1232 and 1820 when the Catholic Church used torture and other unkind means to try to identify religious heresy and affiliation especially of Jews and Muslims forced converts.